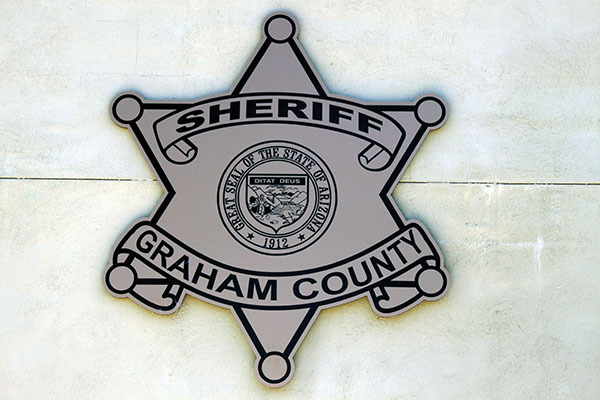 Following is a listing of bookings from the Graham County Jail from April 4, 2017, through April 9, 2017. All information is from the jail’s booking roster. While the following have been incarcerated, each person is considered innocent until found guilty in a court of law. Rofino Dominguez, 28, warrant, GCSO. Kristin Howard, 24, assault, disorderly conduct, GCSO. Elijah Bronson, 27, warrant, GCPD. Julian Bracamonte, 22, assault, disorderly conduct, SPD. Jessie Dana, 21, warrants, SPD. Ryan Campbell, 30, warrant, GCSO. Martin Sandoval, 34, assault, disorderly conduct, criminal damage, GCSO. Samantha Tellez, 24, warrants, SPD. Jose Cuevas, 21, probation violation, GCPD. Robert Hinton, 47, assault, disorderly conduct, SPD. Brett Goss, 24, warrant, GCSO. Duncan Marshall, 17, courtesy hold, GCSO. Jacob Trevino, 29, courtesy hold, GCSO. Desiree Lucero, 33, courtesy hold, GCSO. Phong Le, 30, courtesy hold, GCSO. Michelle Arevalo, 50, commitment order, self. Jaime Hester, 36, disorderly conduct with a deadly weapon, GCSO. Joseph McIntosh, 19, possession of drug paraphernalia, SPD. Dylan Weightman, 22, disorderly conduct, SPD. Michael McClellan, 31, disorderly conduct, GCSO. Cari Adams, 41, warrant, GCSO.